Why in the world, you must wonder, was adniL singled out, the lucky one in ten thousand, to have a detached retina? I've been wondering the same thing, and if you find out who is responsible, I want to know immediately. The flashes of light, giant floaters, and blind spot that I saw (or didn't see in the case of the blind spot) on that fateful Sunday in Berkeley were not the result of a migraine. After 5 days of annoying visual effects and with half the vision in my left eye missing, it occurred to me that this problem might not go away by itself. Once the eye doctor got a good look at me, people in the office began rushing around, making phone calls, and exhorting me to try to relax. I had a detached retina that should be operated on as soon as possible: maybe today. I was sent to a retina specialist who squeezed me into a busy schedule and, upon taking a look, decided to operate the next day. My eye was a complete mess. It sported one giant tear, multiple smaller tears, multiple thin spots that might tear soon, and fluid behind the retina where it didn't belong. The more quickly a detached retina is repaired, the less vision will be permanently lost. Permanent vision loss struck me as an even worse bummer than eyeball surgery. 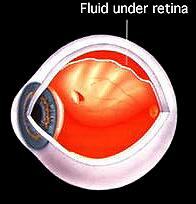 Myopia is a risk factor for retinal detachment, and my left eye is extremely myopic (-23 diopters). Too bad nobody ever thought to mention this risk to me to before it actually happened. 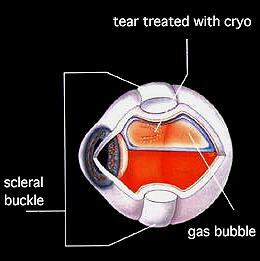 The vitreous gel shrinks with age and can pull at the retina, causing tears. The extra length of a myopic eye causes additional tension. My new bionic eyeball sports a scleral buckle that encircles it to squish the sclera closer to the retina. The fluid was drained from behind the retina and a gas bubble was put in there to press against the large tear so that it could heal against the sclera. I have had to keep my head tilted at a certain angle to keep the bubble in the right place. I could see the bubble in there, which was pretty cool. My expected recovery time is about two months total, and I am expected to recover all of my vision. About a month after my surgery, my doctor decided that he would feel much more confident that this could never happen again if he did some additional tacking-down with a laser. This was really no big deal, especially compared to the scleral buckle surgery. It took five or ten minutes. I sat with my head strapped into a gizmo with a contact-type lens over my eye and looked at a light while the doctor zapped at my retina with the laser. Afterward, it looked like I had been looking into a light. Since I don't see well in my left eye, I didn't notice flashes of light during the surgery while my right eye was looking at the light. This proceedure might have been used alone if I had gone to a doctor sooner. The moral of the story is GO TO A DOCTOR AS SOON AS YOU NOTCE A VISUAL DISTURBANCE! The worst thing about my recovery was the enforced inactivity. After a couple of weeks, I was able to increase my activity a bit, and after six weeks, I was allowed to take walks. I wasn't given the carte blanche for full activity (running and heavy lifting) until six months after the surgery. I became quite weak with all that sitting around. I did lose a bit of vision in the lower left of my peripheral vision, which is where the big tear was (and also the vision I use). I'm good at bumping into strollers to my left in crowds now. As I became more active, the pain became worse again. I would advise anyone who has this type of surgery to keep pain killers on hand, even if you don't think you'll need them. Other than that, I have a tiny white scar that follows the line of my iris underneath it, and my left pupil doesn't function normally. Neither of these things is noticeable to anyone but me, so I rather enjoy them as subtle battle scars. Red eye reduction on cameras (the pre-flash flash) doesn't work on my left eye any more. My eye may be a very slightly different shape than it was. The doctor said sometimes the eye will look droopier with a scleral buckle, but since my eye was already a bit droopy, it's hard to say. It is the right color and texture, which I would never have believed immediately after the surgery. The window to the soul is just an organ after all! Jim Lawton's page has some really great pictures of what the visual effects can look like. He also has a journal of his recovery, photos of what his eye looked like at various times after the surgery and lots of other good stuff. I especially liked the photos of eye surgery in progress. The scar around my iris surprised me, because I didn't know exactly how they got in there (and maybe didn't really want to know). The squeamish might want to avoid that part.